Dentures are prosthetic appliances that are made especially for a patient, in order to replace the teeth that he has lost, with hopes to restore the aesthetics and function of the mouth. You need teeth to be able to smile. You need teeth to be able provide your body with nourishment. You need your teeth to form certain sounds and so need it for speech. You also need your teeth because it holds your bite, the articulation of your upper and lower jaw, to which the muscles and facial tissues rely on. When you lose your teeth, you compromise all the functions mentioned here and if you are not yet ready to let go, you see your dentist about some dentures. When a patient requires dentures, he comes to the dentist where his case will be assessed, after which an impression will be taken. 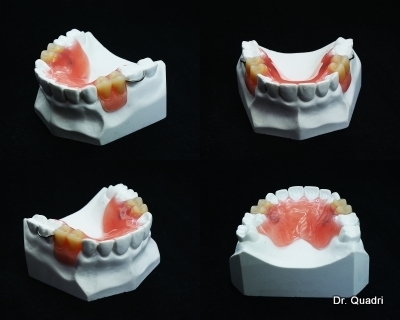 The dental cast constructed from the impression will then be sent to the laboratory with specific instructions as to design, materials and so forth; after fabrication, the finished dentures are delivered to the patient and the patient leaves with a sweet smile on his face. – Loose fit. A loose denture will no longer fit well. It is often dislodged, especially during function. It is often removed from the patient’s mouth when he speaks or while he eats, and it can be quite embarrassing and uncomfortable. The dentures rock and they do not feel good at all. Loose dentures are the result of bone resoprtion, which is normal to aging bone, and it can be resolved by relining or by replacing the dentures. – Tight fit. If you fail to wear your dentures for a time, changes will occur in your mouth and the registered fit that was followed during denture construction is no longer reliable. The teeth and bone may undergo some changes so that it does not fit well, and it may even hurt when you insert it in your mouth. – Broken teeth or components. Artificial teeth can chip, whether it is made ofporcelain or plastic. The metal and acrylic components of the dentures may also break and when this happens, repair or replacement may be in order, depending on the damage. – Damaged denture base. A broken denture base calls for an automatic denture replacement. The denture base is the most important part of the dentures and when it is broken, it is no longer functional. – Dirty or stained. Sometimes, old dentures may be brought to the dentist for some polishing but when the dentures have already endured much, no amount of work can restore it to its beautiful shine, so a replacement is more appropriate. – A new tooth is lost. Dentures are constructed based on the appearance of the teeth and when one more tooth is lost, a new prosthesis should be constructed to accommodate it. Sometimes patients come to their dentists for new dentures, just because they feel it is time for them to have a new one. It is common for patients to require new dentures every 5 to 10 years of continued use. Basically, it is your money you are spending and if you want a new set of teeth, you can have new dentures constructed.